STEP ONE Lower spare tire for access to the winch mechanism mounted above the frame cross-member. 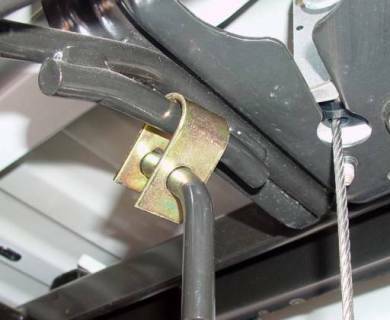 Locate the U-shaped steel bar that centers and supports the spare tire in the full/up stored position. STEP TWO Place the U-bracket over the steel bar as shown, with the D-shaped hole facing the left frame rail. Insert the short bent over end of the lock bar through the round hole side of the U-bracket. Rotate the bar until the flat side of the bar aligns with flat side of the D-shaped hole in the other side of the U-bracket. Position the end of the bar through the U-bracket. Release and let the bar swing downward to a vertical position, which locks the end of the bar to the U-bracket.